Figure 3.157. 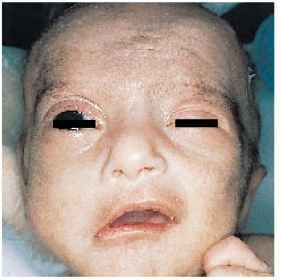 In this view of the same infant as in Figure 3.156, in addition to the hypotonia, some of the characteristic craniofacial features are apparent. Note the almond-shaped, upslanting palpebral fissures and the prominent forehead.